As a loyal Arsenal fan, a team notorious for sitting on their laurels come transfer time (a tendency that has finally come back to bite them, as they sit just out of the top 4, and will need to fight to qualify for the Champions League for the first time in years), nothing warms my heart like seeing a team go after young talent and experienced veterans to improve their chances for the upcoming season. Sporting Kansas City has been keeping my heart nice and cozy all offseason. The good news is, Sporting is widely seen as a team that has no pressing needs in order to improve the team after a monumental season that came with a new name, a new stadium, and a deep run into the post season. Nonetheless, Peter Vermes and his team have been hard at work over at 1 Sporting Way, to keep the fans happy, and to do as best he can to keep Sporting in contention next year, and for years to come. Here’s just a few of the more important off-season moves from the people at Livestrong. 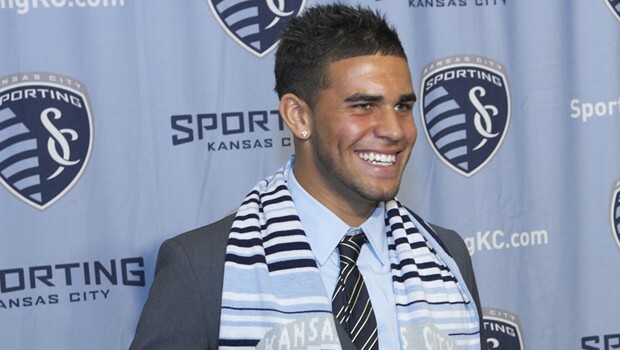 Sporting’s pick in the first round of the MLS SuperDraft was Englishman Dom Dwyer, an attacker out of the University of South Florida. First, some stats: 16 goals and 2 assists in 21 matches, Big East Offensive Player of the Year, leading goal scorer in the Big East conference, and a member of the NSCAA’s All-American Second team. The Big East Conference Player of the year, Dom Dwyer, looks to crack the Starting 11 this season. Previous to his time at South Florida, Dwyer played at Tyler Junior College, where he scored 52 goals in 2 seasons, and won back-to-back Junior College National Championships. The man is a goal-scoring monster, but I don’t see him starting anytime soon. As I said earlier, Sporting is a team with very few pressing needs, and the front line is the least of Vermes’ problems, with the so-called “#StrikeForce” (as they like to call themselves), consisting of C.J. Sapong, Teal Bunbury, and Kei Kamara, all three of whom play at the international level. As an added bonus, Dwyer is a Generation Adidas player, meaning he doesn’t get counted against Sporting’s salary budget, which, says Vermes, “doesn’t put a lot of pressure on him to have an impact right away, and it keeps him off-budget for us.” With the loss of Omar Bravo, however, Sporting gains a solid forward presence off the bench in Dwyer, and more importantly, an attacker who can grow into a starting player over time. One of Sporting’s main weaknesses this past season, especially early on, lay in its defense. This was the inspiration behind Sporting’s second MLS SuperDraft pick, central defender Cyprian Hedrick. Coming out of Coastal Carolina University, Hedrick was primarily picked, according to Vermes, as “someone we can develop.” Again, since Sporting has few holes to fill, the coaching staff and Vermes looked mainly for raw, talented players like Hedrick, who received All Big South First Team honors, and Big South player of the year. Hedrick gives Sporting room to breathe on the injury front and keeps us in good shape for the future with the back line. Sinovic, a native of Leawood, KS, and a former Rockhurst Hawklet, played a tremendous role in Sporting’s amazing season last year. As a wing defender, Sinovic was a rock (no pun intended) both on Sporting’s back line and as an attacking winger. Sporting left Sinovic open in the MLS Expansion Draft, where he was picked up by the Montreal Impact, much to the dismay of many of Sporting’s fans, with whom Sinovic is a favorite. Five days later, however, Sinovic was back on his way to KC in exchange for Davy Arnaud. By retaining Sinovic, Vermes essentially keeps his entire back line, with a full season of experience together, intact, and important move to keep our defense strong. In addition to these three, Sporting holds on to Graham Zusi, Teal Bunbury, and C.J. Sapong, who are all three currently featuring for the USMNT (with Zusi providing the game-winning goal in the team’s third straight win over Panama). Chance Meyers, the White Puma (Jimmy Nielsen), and Aurelien Collin also return to provide solid defense. The future looks bright at Sporting Park, and look for me in the front row of the Cauldron this upcoming season. #IBelieve. This entry was posted in Home, Midwest, Soccer, Uncategorized and tagged Briek, Dom Dwyer, I believe, soccer, Sporting. Let me pose this question to you the team’s owner is Stanley Kroenke who also happens to own the Rams as well number of other sporting interests . Do you honestly feel that he’s interested in the Arsenal organization or simply using it as another way of making money ? Your thoughts ?